Carnac is a seaside town in the northwest of France. It is known for having a large number of megalithic sites that date from 3300 to 4500 B.C. 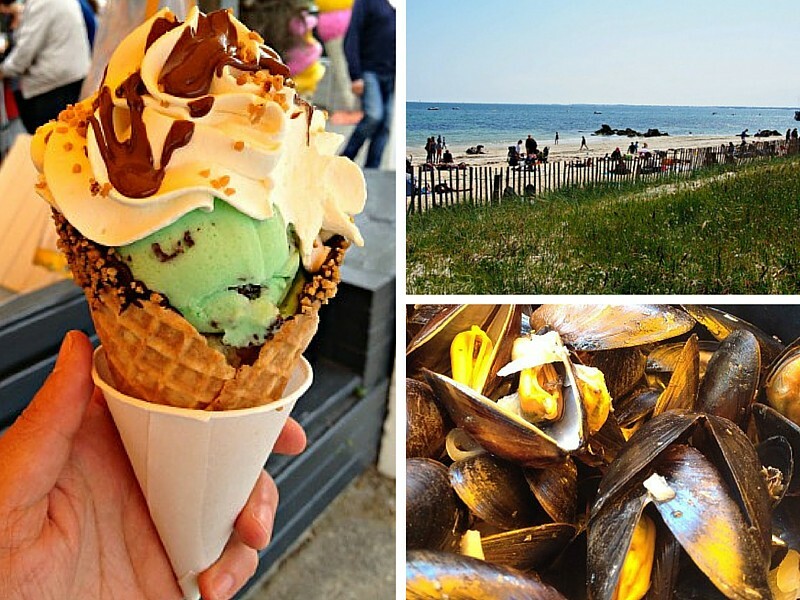 It is a popular holiday destination for British and Irish due to the short distance from the ferry at Roscoff. We took a ferry from Irish Ferries from Rosslare, Ireland to Roscoff, France. The cost for a one-way ferry to France for 2 adults, 1 child, and a car was 209 euros. This is an overnight ferry so that price includes a twin bed, two star room without a window. Larger and nicer rooms are available. The price increases dramatically in peak season (July and August). There are several restaurants onboard, as well as a cafe and a bar/lounge. Prices are reasonable for a family in the The Left Bank Brasserie, especially if you buy the “Family Meal Deal” in advance when you purchase your ticket. There is also a steakhouse and a “waiter service” restaurant that draw very mixed reviews on TripAdvisor. The cafe has sandwiches and terrible coffee. The children’s play area is padded and only for very young toddlers. There is an arcade for older children. For adults, there is a cabaret show in the evening which we did not check out. There are a dozen campsites around Carnac. We chose Les Bruyeres because of its proximity to the Ménec alignments. There are other campsites closer to the beach if you prefer. I like camping in France better than staying in hotels. There is usually a heated and/or covered swimming pool, a playground and other entertainment for kids. If you don’t like the idea of staying in a tent, most campsites have small cabins or static caravans to rent. Les Bruyeres rents out bicycles and is within easy cycling distance of many of the major sights. With the ACSI Camping Card, Les Bruyeres was only 18 euros per night for a shaded tent pitch in low season. Good value overall but the wifi only works near reception and the toilet/shower block was clean but desperately needs an update. The heated and covered pool was excellent and had a shallow area for toddlers. There are two playgrounds but they are on sand which I really dislike but my son enjoyed. There is a large Super U supermarket 2.5 km away, next to the tourism office in Plouharnel. There is a also a shop that has some supplies for camping and caravanning in Plouharnel: Le Mignan Arnaud. If you need ice for your ice chest, it is hard to find. Super U did not have it and neither did any of the fuel stations we checked. There are several different tours of Carnac available. We took the Carnac Visio Tour which starts across the street from the Ménec alignments. This is small, open roofed minibus. The sign said that the bus stopped for photo opportunities but it barely slowed down at most of the sites and you could only see anything if you were sitting on the left side of the bus; a complete waste of money! 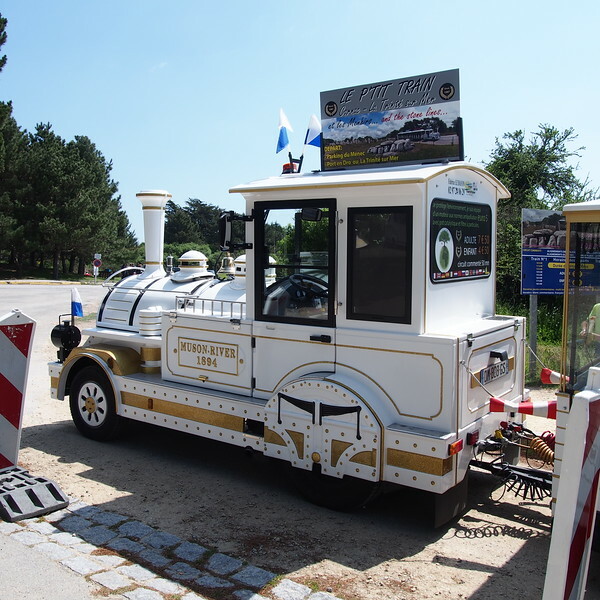 There is also a small, white tourist train that makes a circuit past the alignments and down to the port. I don’t know if it slows down for photos but it might be more fun for small children who like trains. In all honesty, the best idea is to rent a bicycle and enjoy all the sites at your own pace. 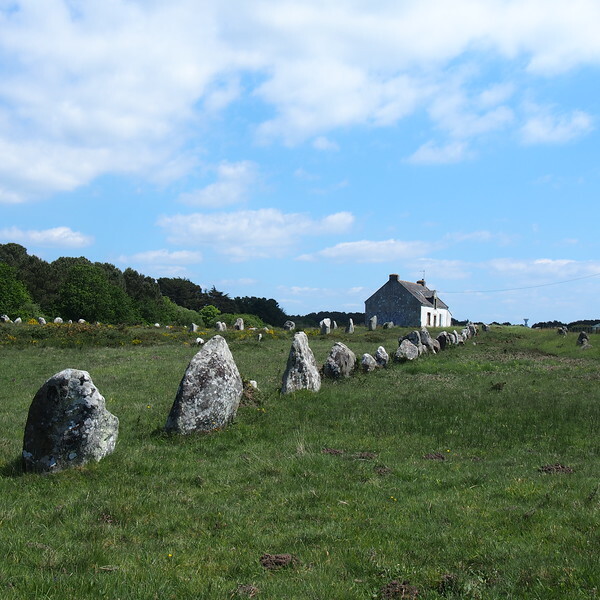 The meaning behind the alignments of over 3000 standing stones in Carnac is a mystery. It is agreed that the stones were erected between 3300-4500 B.C. but there is no solid evidence of their purpose. Why would Neolithic people spend so much time and tremendous effort moving and raising stones, the largest of which weighing more than 20 tons, into long lines stretching for 800 to 1300 meters? There are no answers here, only more questions. 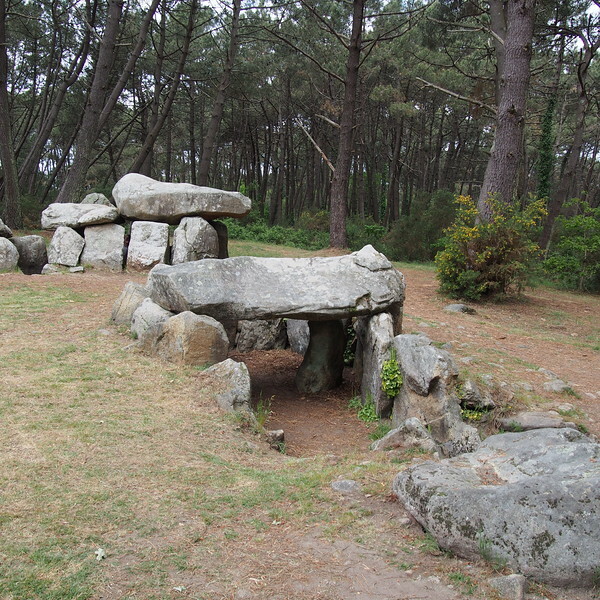 There are several dolmen sites in Carnac but the Mané-Kerioned group of three dolmens is the most impressive. They are within cycling distance of the Ménec alignments but you will have to cross a sometimes busy motorway to reach them. Bring a flashlight so that you can see the carvings on the stones inside the one closest to the road. Enjoying the seaside at Carnac. The Atlantic ocean is cold and most people are not tempted to swim until mid-June. Even in low season, the seaside is a pleasant place to spend an afternoon getting a little sun. When we were there in mid-May, some restaurants and shops only opened on the weekends and holidays so it may be a little quiet during the week. On a warm day, be sure to stop by L’Igloo (56 avenue des Druides) for an ice cream. The one in the picture above is a scoop of After Eight candy flavour, a scoop of pistachio, and topped with Nutella and whipped cream. Yummy!